Contact Us - If your answer is not found here. 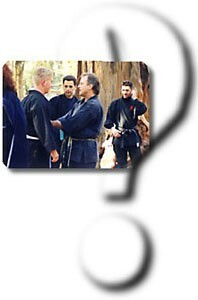 Are you part of the future of the Bujinkan teachings? The future of the Bujinkan teachings will depend on its instructors knowing how to properly transfer the art’s knowledge to their students and for these instructors to represent themselves as confident professionals both in and out of the dojo. We want our instructors to be examples for others to follow and we want to know that they have been given training in how to teach well. Our intent is to make the transition from student to instructor easier. This is why IBDA now requires the completion of this Shidoshi (Teacher of the “Warrior Ways of Enlightenment”) Training Course for all students that want to become Shidoshi-ho instructors with IBDA. Some people will learn to teach in a dojo setting while some may only train outdoors with a few friends – either way this Shidoshi Course is designed to make you a better teacher and to truly understand more about the ‘Do’ (the Way aka the Tao) and its influence on the Ninpo art that we study. It is wonderful if you can attend our IBDA dojo classes directly or train with a certified instructor but if this is not available to you then we have complete Distant Learning Programs such as the Shodan BlackBelt Home Study Course and the Nidan, Sandan, Yondan, etc. courses. Taking you for Beginner to Master. You can go just as far as you want to go with us – many have already. Just start with the Shodan Course and work your way to the top. When should I start this Bujinkan Masters Course? Any time is Perfect. Many people love to go ALL IN so that they can have all the knowledge to study or review anytime that they want. Others only want a portion at a time. The beauty of having it all is that when your skill set gets better you may fall in love with a particular weapon for awhile and the Masters Course gives you the chance to go directly to that advanced information. I am an ALL IN kinda guy. If it is worth doing it is worth doing it well and i want to be well educated. The Masters Course gives you an incredible library of knowledge all in one easy access place. Study Anywhere! Study Anytime. You chose your pace of learning. Do I have to be in the IBDA to purchase this Masters Course? The Bujinkan Masters Course is for ANYONE that wants a comprehensive library of knowledge on the arts of the Bujinkan. You Do Not have to be an IBDA member to get this course — at this time. This has been a big debate with my staff and current Shidoshis. This course is so loaded with unknown secrets of the art that they wanted me to keep this knowledge only for the people directly training with us. But I want everyone to benefit and have an opportunity to learn this knowledge so I told them that I would test offering it to everyone. I want you to know that at anytime I may stop offering this course to the general public and make it only available to IBDA enrolled students. That’s why if you think this course is for you then I suggest you get it now while you still can. I know that this is an excellent course as it reveals 40+ years of my own teaching knowledge and took me over 20 years to produce it all for you. I really put a lot into it so that you could become the best teacher you can be. Take advantage of this opportunity now while it’s available. This is a BIG Course – What order do I Study the Masters Course? YES – This is a BIG COURSE. It is meant to be a University level Comprehensive study of the art from brand new beginner to 5th Dan. That is a lot of material! And that is the beauty of it. I do not know about you but I love being an “ALL IN” kinda guy. I want it when i want it. I love being able to look up a waza from a certain school anytime I want. Or studying the history of a school. Or listening to a teaching lesson. Or to be able to play a technique over and over until I get it. Bujinkan Masters Course is for ANYONE that wants a comprehensive library of knowledge on the arts of the Bujinkan. Of course you can study Anything – Anytime and Anywhere you want (as you also have the NinjaDojo Online Course Too). And the course was made to be studied in a progression from 9th kyu to Godan (5th Degree Shidoshi). Shodan Course – 9th kyu to BlackBelt – building your solid foundations for all other training. Shidoshi Course – Learning to properly share the arts – at some point you will want to share it with someone. Budo Taijutsu Course – Here you learn the deeper aspects of the arts and how to master the art. There is much more that is not even listed here, especially in the Online Ninja Dojo. It may take you 20 years to go through it all and that is the beauty of having all this knowledge in one place. I know that this is an excellent course as it reveals 40+ years of my own teaching knowledge and took me over 20 years to produce it all for you. I really put a lot into it so that you could become the best martial artist you can be and to accelerate your learning curve. I want everyone to have the opportunity to learn these arts. Will I have the skills to open my own Bujinkan dojo? By studying this Bujinkan Ninjutsu_Budo Taijutsu Masters Course you will have the skills to start a training group and to open up your very own dojo. Why not you? People are doing this worldwide and this course has greatly helped them do just that. Our goal is for you to have the knowledge in front of you to go as far as you want in the arts. Know that it is going to take you awhile and you success will depend on your hard efforts. This art is a path…. for many that path is an endless one. It is a journey of self discovery. One in which is extremely rewarding in sharing it with others. We highly encourage you to align yourself with a good teacher and get properly certified both in rank and physical training. The knowledge presented in the Bujinkan Masters Course is very comprehensive and once learned will give you an endless amount of knowledge to share to others. So YES, this course will help you if your desire to open a Bujinkan Dojo. How do we really know? Great question. Well we can honestly say that countless others have become teachers through studying this course. That is one of the reasons Shihan Richard Van Donk wrote an entire course on becoming a teacher. Please note that Richard was a Master Trainer in NLP and DHE modeling skills where he trained others to be teachers in a complicated science based system. He also was a public speaking trainer. In his own dojo, Richard has taught many brand new students into being great instructors and has over 40 years teaching experience and public speaking. So whether you choose that journey with us at IBDA or not you can be assured that we have done our best to give you the written skills and lesson sets, video teaching examples and audios of the course to embed in your mind that you need to become successful. We want everyone to be able to enjoy and share the arts as we do, because we love these arts. But the greatest gift of all is what you will feel inside, experiencing the changes you have made in your own life and how these changes affect others around you because of your dedication and hard earned efforts. These studies have been proven to change lives! We support your journey in sharing the arts. Best gift back ever is sharing forward! in Ninjutsu in your own home at your own pace! 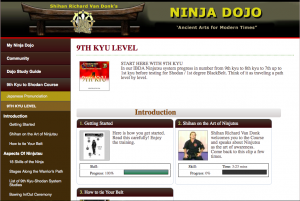 This revolutionary Ninjutsu Home Study Course pioneered by Master Richard Van Donk, 15th dan, is used by high ranking Ninjutsu instructors and beginning students alike with great success in over 75 countries worldwide. Seven years, 1000’s of hours of research, lots of blood, sweat and tears, and almost ¼ million miles of travel in about 50 trips to Japan to personally train with Grandmaster Masaaki Hatsumi and other Shihan teachers went into providing you with this very comprehensive step by step Black Belt curriculum. There is none like it anywhere else in the world. The elite World Grandmaster Council (WHFSC) gave us the best top International Videos Award in 1999. Find out why for yourself! Train at home on your own time at your own pace! WHY A HOME STUDY COURSE? Simply put, authentic Ninjutsu is hard to find in many parts of the world. There are not qualified instructors available on every corner. The Ninjutsu Blackbelt Home Study Course gives people who are not fortunate enough to have a teacher near them an opportunity to study this art in a step by step manner, offers them a way to get feedback on their training, and if desired, obtain a certified ranking. From the reports of our video students this is a dream come true. The Ninjutsu Blackbelt Home Study Course even helps those who have a Ninjutsu dojo near them to practice the lessons at home, enhancing their training. Our students who train at the dojo and at home with the course advance at least twice as quickly. The Ninjutsu Blackbelt Home Study Course also creates a standard for growth and gives a new blackbelt a method for becoming an instructor themselves. WHO WILL BENEFIT BY STUDYING THE COURSE? People who want a life change, new martial art students, families or buddies who want a hobby together, those who train but want more information, to learn faster, those without instructors, instructors who want a curriculum for students, blackbelts in other arts and schools who want to add to their system, knowledge or credibility. Our success tells us that our Ninjutsu Blackbelt Home Study Course will give you the edge you need to become a better martial artist. Simply enroll in the Ninjutsu Home Study Course by either purchasing the complete course at a discount or getting at least the 1st three videos, Shodan manual & a membership. This allows you to register as a Ninjutsu student by sending in your student application. Obtain through us or your local martial arts shop a black uniform with a white belt. You do not need to have tabi shoes, (some do, some don’t). Over time you will need to get or make a few wooden weapons such as a knife, 3ft staff, 6 ft staff and a wooden sword. Study each move on the tapes over and over until you can do them easily just like it is on the tape. Most students take about 3 months at each kyu level, achieving their blackbelt in 2 1/2 years of dedicated study. If you are athletic or already have martial arts experience you may go faster through the levels keeping in mind that the basics are the foundations that you build your Blackbelt and above training on. This Course was carefully crafted over 7 years to give you a natural progression of material. These are REAL ranks and must be earned with very hard work and perseverance. HOW DO I TEST FOR RANK? Testing is simple. Upon becoming a registered student we provide you with a list of what techniques to demonstrate while being filmed on video tape. Send in your video test and an upper level blackbelt instructor will carefully review and grade your skills, give you great feedback inspiring your improvements in the areas needed. We’ll mail your certification for 9th kyu to1st kyu ranks. The blackbelt test must be done in person at a semi-annual camp, seminar, tai kai, dojo or private appointment with one of our many IBDA instructors. This is a real blackbelt and we want your day to be special! Click on Rank Testing to go to that section for more details. CAN I STUDY THE COURSE WITH A FRIEND? It is fun to have someone you can share this art with. Each of you will inspire each other’s growth. Understanding this we designed a plan where you and a friend can share your training at a reduced price. It is all described in the Shodan training manual. CAN I REALLY LEARN WITH DVDS INSTEAD OF AN INSTRUCTOR? WHO IS MASTER RICHARD VAN DONK? We have turned out great Blackbelts all over the world. Others have done this. Why Not You too? Complete Teacher Training Course for only $227!!! It will save you years of errors and heartache. If this course only helps you get and keep only 1 student for 1 year you will have more than doubled your investment!